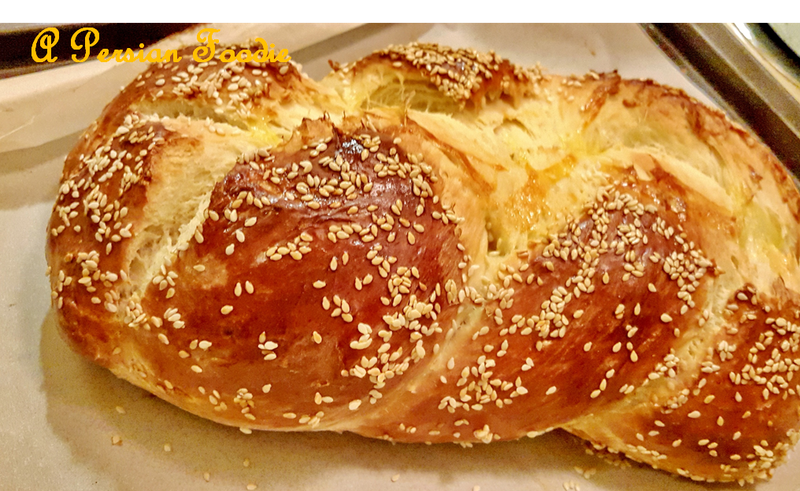 Challah (Persian:نان گیسو) is a delicious traditional Jewish bread. It is great for breakfast since it is sweet and savory. Sprinkle yeast over barely warm water in a large bowl or stand mixer. Beat in honey, oil, egg, and salt. Add the flour one cup at a time, beating after each addition. until smooth and elastic and no longer sticky. Cover with a damp clean cloth and let rise for 1 1/2 hours or until dough has doubled in bulk. Put risen dough out onto floured board. Divide in half. Divide each half into thirds and roll into long snake about 1 1/2 inches in diameter. Pinch the ends of the three snakes together firmly and braid from middle. Form into a round braided loaf by bringing ends together, curving braid into a circle, pinch ends together. Grease a baking tray and place finished braid on it. Cover with towel and let rise about one hour. Beat the remaining egg and brush a generous amount over each braid. Sprinkle with sesame seeds if desired.